Black Lives Matter Alliance of Broward would like to continue to declare its solidarity and support to the students of Marjory Stoneman Douglas High School, as well as students across Broward County and Florida that are continuing walk-outs, protests, and other acts of civil disobedience to demand an end to the gun violence status quo. 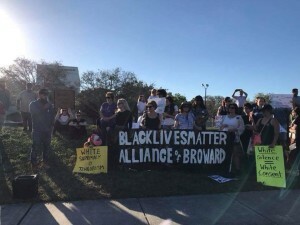 On Sunday, February 18th, #BLM954 joined the massive, on-going scene outside MSDHS, holding a rally to support the community and to decry on-going white supremacist, patriarchal violence that has become a pervasive threat to children and minorities through-out the United States. Since the tragic events of last Wednesday, students across Broward County and elsewhere are engaging in countless, ongoing, walk-outs and protests…far too many to list here. While we do not explicitly support calls for greater gun control, we strongly support the continuing efforts to build a new youth movement, starting right here, that challenges the oppressive system that has deserted them, following the path laid by centuries of civil disobedience in this country and throughout the world. “Gun control” is an issue with many countless implications for the poor, people of color, and other marginalized people that we seek to raise up. As this movement progresses, we have full confidence that our youth can achieve an intersectional consensus on fighting this issue. We need to not only rise above the left-right gun control quagmire, but orient our society towards solutions that break the monopoly of armed violence held by our police forces, military, and privileged white males. Too often, gun control issues leave behind those that our movement is dedicated to defend – people of color and incarcerated people, who are dispossessed from gun ownership, minorities and the mentally ill, who are already over-policed in schools as well as the rest of our society, and so on. We seek to unite these issues with the coming tide as we unite with people of color, immigrants, Jewish people, LGBTQ+, and other minorities that are the most frequent targets of armed violence in this country, regardless of the source. On Sunday, a small group of people waving Maoist-style Chinese flags joined our rally on Sunday and took this somber occasion as an opportunity to get into a number of arguments with community members who were there to pay their respects. So we would also like to emphatically state that this type of behavior was completely inappropriate and created almost the exact opposite effect of showing solidarity and love with the people of West Broward. We support the community of Parkland and the students of Florida because we know all too well the deadly consequences that our white supremacist, patriarchal, violence-obsessed society brings to the marginalized and vulnerable. Having more volatile, aggressive men coming there to demand attention to their own fringe political agenda does nothing to bring change to where it is so desperately needed.